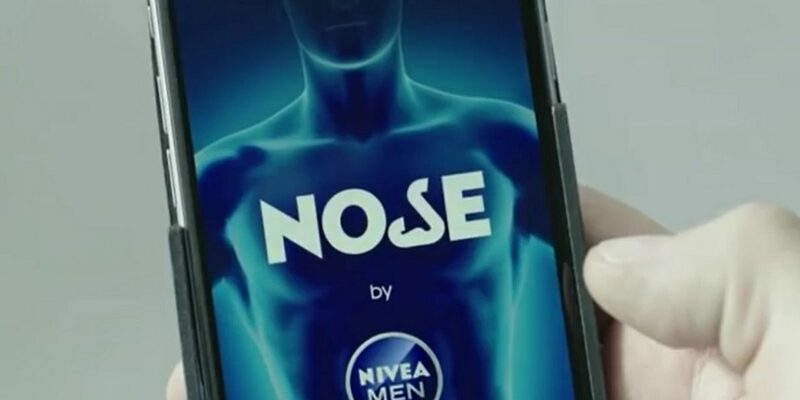 Nivea Men has collaborated with Happiness FCB to create a novel smartphone app to help men determine when their body odor is discernible to others. According to Nivea’s research, men sweat more than women but have 40 percent less brain capacity to perceive odors, meaning that they are often unaware when their scent is unpleasant to others. “Our nose is so used to our own body odor that we can’t smell our own sweat,” explains Nivea Men’s campaign material. The NOSE app communicates with sensors on a custom phone cover to guage body odor when it is activated and placed next to the user’s armpit, rating the scent as ‘It’s OK’, ‘It’s Time’, or ‘It’s Urgent’. The app also contains a link to Nivea’s online store for deodorant emergencies. The app is currently being tested worldwide and is expected to launch onto the consumer market later this year.